The Olympic Games Marathon requires strength, courage and endurance. And it’s a case of ‘what’s in a name?’ with Olympic Caravans’ Marathon Club Lounge. It’s a quality on-roader bred to ‘run’ a long distance and will take you well beyond 2.195km, if you get my drift. 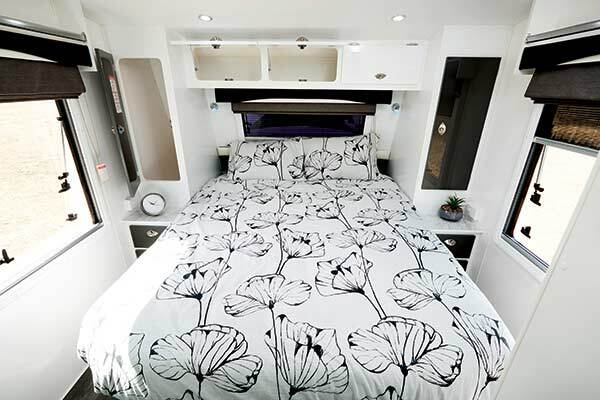 The 7m (23ft) model we tested certainly ‘wins the race’ in terms of its chic interior. Obviously the standouts are the plush rear club lounge adorned in plush San Diego black leather, which converts to a double bed, and of course a bona fide ensuite. The jaw-dropping rear club lounge with headrests is located immediately to right of entry, and this total relaxation zone also comprises a telescopic dining table, wraparound overhead cupboards, a window on the offside festooned with a curtain and pelmet, a slide-out drawer under the seating closest to the entry door, a rear window, a double power-point also under the seating, and two reading lamps. There is also a large skylight to the front of the lounge for added light and ventilation. 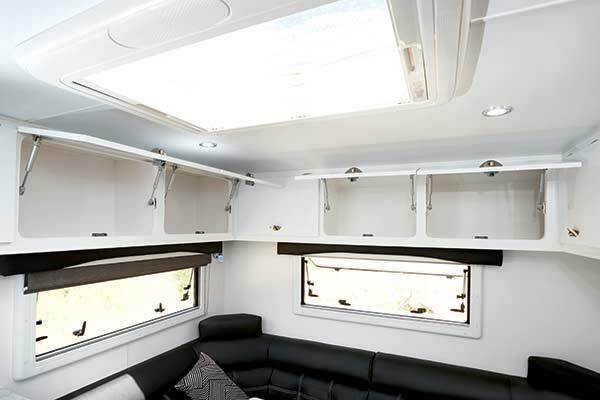 Glossy acrylic StyleLite Arctic overhead cupboard doors provide additional eye candy, which is a continual theme throughout the van, complemented by StyleLite Graphite lower doors. And the cabinetry is 15mm lightweight plywood. Meanwhile, the ‘split ensuite’ — along with the front bedroom — showcases excellence in design. When drawn, a privacy screen conceals the bedroom/ensuite area. Behind an opaque door on the offside are a Thetford cassette toilet to the left and a vanity to the right which has a washbasin, with double cupboards above and below, and a mirror. There’s also a window for ventilation, lighting and a powerpoint. And behind an opaque door on the nearside is an angled fully-moulded fibreglass shower, with a 12V hatch. 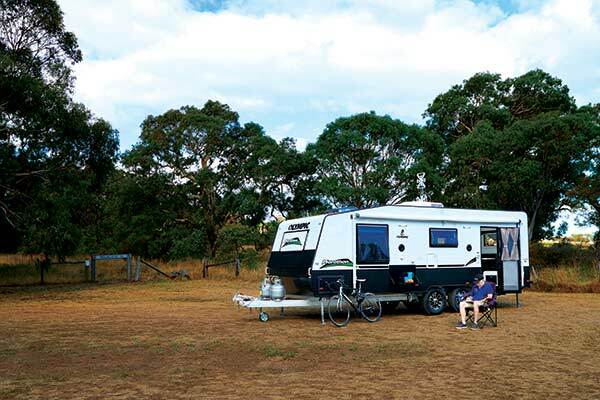 There’s plenty of room to move around the palatial boudoir which features a caravan-queen-size bed with a padded bedhead, capacious wardrobes, dressers with benchtops, and three overhead lockers. Good-sized windows have blinds and pelmets, as does a front window. And there is railed shelving above the side window pelmets. A TV swivel bracket sits behind a wall where the toilet is mounted, plus there are two reading lamps, an internal speaker, a double powerpoint on the offside wall, powerpoints either side of the bed, and a skylight above the bed. Opposite the entry door is abundant storage and benchtop space, including three slide-out drawers and a large cupboard housing a concealed 3kg Dometic WMD-1050 front-loading washing machine. Above the benchtop is the electrical suite (located in a cupboard). Alongside is the Fusion stereo system, gauge for the water tanks, water pump switch and water heater switch. And moving further toward the front of the offside wall is a full-height five-stack wire basket pull-out pantry followed by a Dometic AES RM 4606 three-way fridge, with a cupboard above. Directly opposite is a modish kitchen with all the necessary mod cons, including a Swift gas/electric stove/oven with grill. 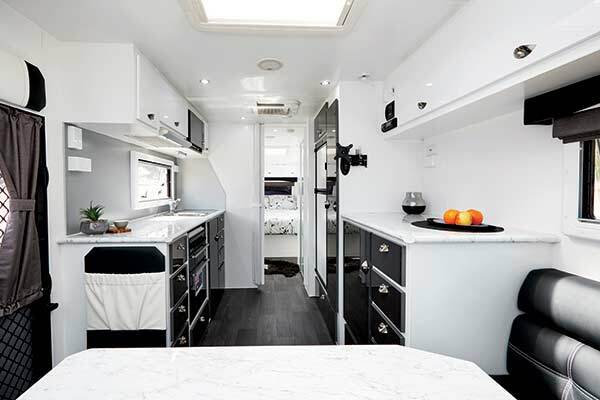 And at each end of this impressive galley are three slide-out drawers and a fold-down compartment, and once again heaps of benchtop space. 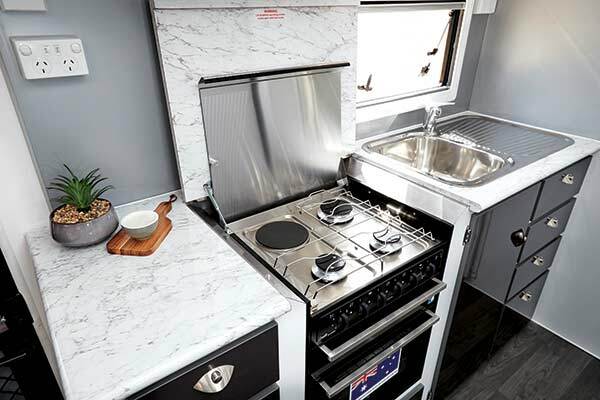 There’s also a window, two double powerpoints, a 23L NCE microwave above the sink, a cupboard below the sink, and three storage compartments above the benchtop. There’s an internal speaker in the spacious kitchen/lounge zone and more than ample LED lighting throughout. And climatic control is provided by an Aircommand Ibis 3 reverse-cycle air-conditioner. 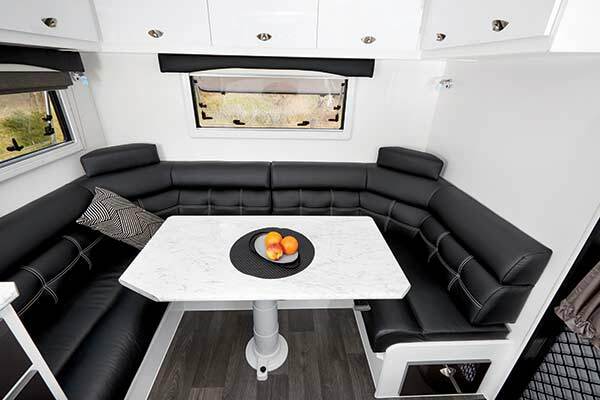 Externally, the composite-clad Marathon Club Lounge boasts a TV box and two speakers for entertainment, a fold-down picnic table, and two lights. 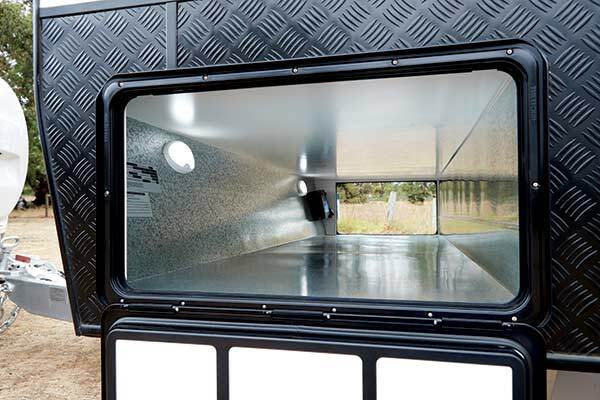 And the van’s front wall has a window protector and high checkerplate as does the rear wall, with a spare wheel mounted on a two-arm bumper bar. 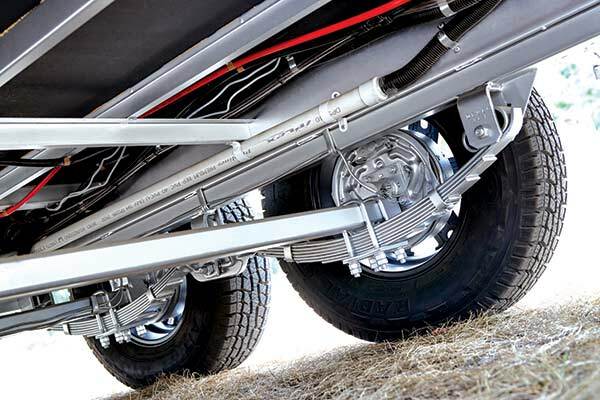 The 6in drawbar, which is extended by 300mm, is home to an AL-KO 50mm ball coupling and two 9kg gas cylinders. However, there’s no protection for the gas cylinders and water tap. My main beef on the outside is the limited external storage. I reckon a front boot would complement the full-width tunnel boot. And strangely, there’s no pull-out manual step. This Marathon rides on a 6in SupaGal Preston Chassis, rocker roller suspension (raised 50mm), 12in electric brakes and 15in silver alloy wheels. It also has sufficient capacities for life on the road — battery (1x100Ah plus 15A C-Tek charger), solar (1x120W) and water (2x95L freshwater; 1x95L grey water). 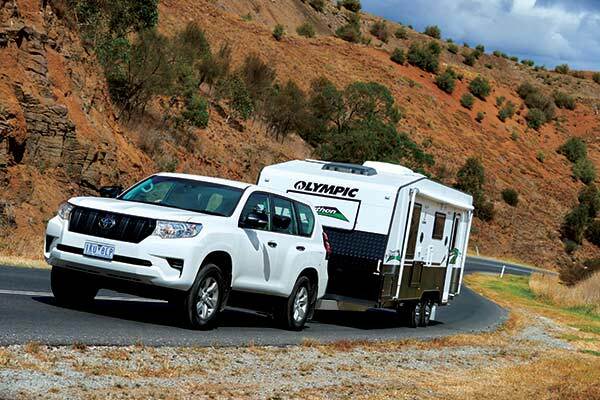 We picked it up from Caravan Sales Centre in Campbellfield where we took it for a spin north of Melbourne’s CBD and it stuck firmly to the bitumen, offering an ultra-smooth ride behind CW’s Toyota Prado GX press vehicle. 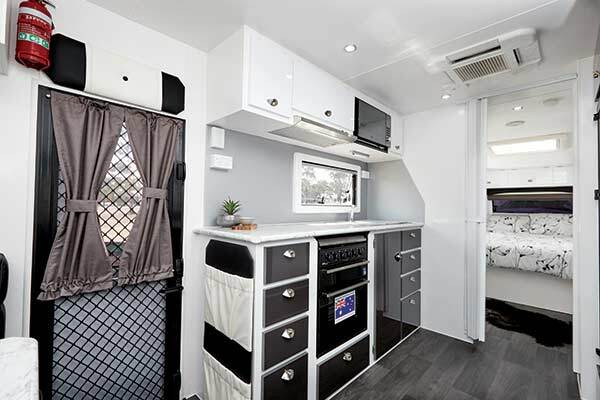 With air-conditioning, awning and washing machine all included as standard features, this new Marathon is in a race of its own when it comes to price. In fact, priced as tested at $63,000, this caravan simply takes the value-for-money gold medal! Even that fabled Athenian messenger, Pheidippides, would be impressed.